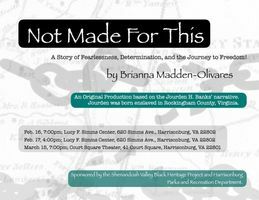 The Lucy Simms Center presents the premiere of Briana Madden-Olivares’ original musical based on the Jourdan Banks narrative. Jourdan, born enslaved on what is now Merck’s facility in Elkton, VA, was sold south in his late teens, fought and escaped several times. He finally made his way to England where his story was eventually written by black abolitionist, James Pennington, in 1862. Shenandoah Valley Black Heritage Project.